If you’re looking for a gym grade cable cross over machine, the XMark XM-7626 is definitely a model to put on your list. 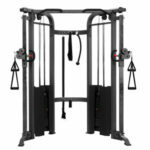 This functional trainer is similar, up to a point, to the Body-Solid GDCC210 but it’s equipped with heavier weight stacks, is considerably more versatile, and comes with several extra accessories. The XMark XM-7626 functional trainer features an extremely sturdy and well-engineered frame. Needless to say, most of the parts in its frame construction are made of steel, 11-gauge, 2″ x 3″ for the main frame bars. Also, the finish on the main frame bars is gray in color, being corrosion and scratch resistant. However, the upright bars of the adjustable pulleys, as well as the guide bars of the weight stacks feature a chrome finish. Considering that it comes with two 200 lbs weight stacks, the fully assembled machine is extremely heavy, weighing over 800 lbs. This means it has a lot of stability on its own; you won’t need to anchor it to the floor. Its bases feature rubberized pads for floor protection, which also enhance its overall stability. On the other hand, this XMark cross over machine does not have an extremely large footprint. The distance between the widest points of its bases is 65″ (165 cm), while its depth is 43.5″ (~110 cm), while the space between the adjustable pulleys is approx. 60″ (152 cm). Its setup height is 84″ (~213 cm) which means it won’t fit in a room with a 7′ ceiling, or it will be quite a tight fit, without leaving any room for pull-up exercises. In other words, it’s recommended to place and use this machine in a room with at least an 8′ ceiling. 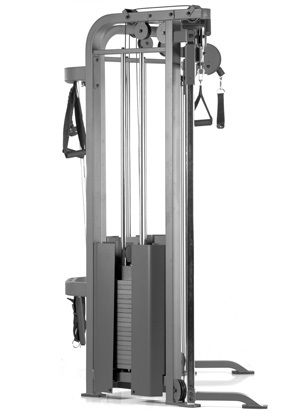 All these being said, this XMark trainer can accommodate users up to 6’5″ (195 cm), promoting a correct execution of all exercises. This functional trainer cable machine is equipped with 16 pulleys made of heavy duty nylon material; all pulleys integrate industrial grade, sealed ball bearings for smooth operation and prolonged use. There are 19 adjustment positions for the side pulleys, the adjustment slots being 3.5″ (~ 9 cm) apart. Their lowest setting is 1′ (30.4 cm), while the highest position is 6’6″ (198 cm). The adjustable pulleys can also pivot on their upright axis, offering excellent flexibility for all exercises. Also, each adjustable pulley assembly is equipped with a handle, which facilitates its adjustment. The cables supplied with the machine are aircraft quality steel ropes; they feature a sheet of PVC material to deliver a smoother glide over the pulleys. Each cable can extend up to 81″ (206 cm) from the pulleys. 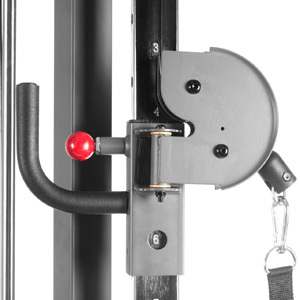 The top frame bar of the machine is equipped with a set of handle grips for pull-up exercises. They’re rubberized in order to deliver a secure grip. Their weight capacity isn’t specified, but they should support users up to 300 lbs (136 kg) with no problem. This XMark home gym comes with a pretty complete set of accessories. To begin with, you’ll get a set of two handle grips with short straps (8″ – 20 cm) and a set of two handle grips with long straps (17″ – 43 cm). A triceps rope (23″- 58.4 cm), a long bar (42″ – 106.6 cm), a short bar, and one ankle strap are also included. Plus, the box includes a poster that covers 35 standard exercises that can be performed on this trainer. However, a bench for presses is not included. So, in case you want to perform chest presses you will have to use your own bench or improvise. 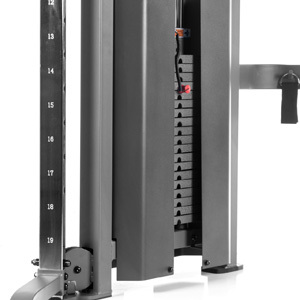 This XMark functional trainer cable machine comes with two weight stacks, 200 lbs (90.7 kg) each. Each plate weighs 10 lbs (4.5 kg), which pretty much means that the adjustment increments for each stack are 10 lbs. One of the pluses of this crossover trainer is that the weight plates are made of cast iron, not cement or other materials. They’re extremely durable and with proper use, they should last a lifetime. Each weight stack features two metallic side guards for the lower part, which considerably improve the safety of this machine. Each stack glides on a set of two guide bars, resulting in superior stability for the plates’ movement. Last but not least, the weight stacks are not upgradable. Also, there aren’t any custom 2.5 lbs or 5 lbs weight adapters to offer lower adjustment increments than the standard 10 lbs. Evidently, the bench press exercises do require a bench, accessory which is not included with this XMark home gym. However, the straight bar is included. For ab crunches, you will need an ab harness which is also optional. The assembly of the XMark XM-7626 functional trainer is not extremely complicated. However, due to the many parts included, it will take at least a few hours. Due to its massive weight, it’s recommended to be transported and assembled by at several people. All the tools required are included. Regarding the maintenance of the machine, one important recommended aspect is applying some silicone lubricant onto the guide bars of the weight stacks. It is not a bad idea to do this during assembly, as it will lead to the smooth operation and adjustment of the machine. Also, if the pulleys begin to squeak, a bit of silicone spray lubricant should fix this problem. Weight stacks are not upgradable. The XMark XM-7626 is a gym quality crossover functional trainer, equipped with two 200 lbs weight stacks (10 lbs per plate). It offers 19 adjustment positions for the front pulleys and comes with several accessories, including handle grips, short bar, long bar, triceps rope and ankle strap. It gives you the possibility to perform more than 35 gym quality exercises, being a perfect trainer for users of all levels. And finally, even though it’s not exactly an affordable fitness machine, it definitely offers great value for the price.